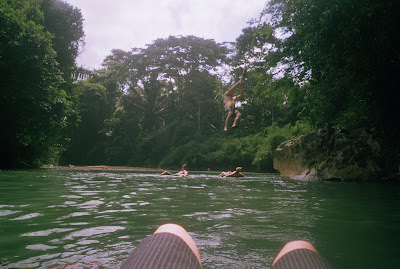 In Belize we went cave tubing! It was cool! We "hiked" in to the jungle for maybe 20 minutes. We went in to some caves and saw some bats, stalactites and stalagmites. We reached the spot where the river opened up. We all got in the water there. We were linked together ankles in the person in front of you's arm pit. I didn't know the guy in front of me and he was sweaty luckily we were in the water! It was really cool floating in the dark through the caves! I even saw a water snake! Here are some pictures of Mike on a rope swing. As they say when the water gets shallow "Bums up"!